I love these delicious lemon cupcakes. They are like a lemon pudding cake but in individual servings. My mother used to make them when I was young and I couldn’t wait to lick the lemon pudding bowl. Preheat oven to 350ºF degrees. Grease or line the muffin tins. Cream the butter or margarine well with an electric mixer. Add the sugar gradually, beating until light and fluffy. Add the eggs, one at a time, beating well after each addition. Add the lemon juice and milk. Sift together the flour, baking powder and salt. Add the dry ingredients one third of the mixture at a time, stirring after each addition. Spoon the batter into greased or lined muffin tins. Bake 15-18 minutes. While the cupcakes are baking, make the lemon pie filling. When the cupcakes are cooled, use a sharp knife to cut a round hole in the top of the cupcake. Fill the hole with the lemon pie filling and place the piece you cut out back on top of the pudding. Alternately, you can leave the tops off and have the lemon pudding top the cupcakes as shown in the image above. You can sprinkle the tops of the cupcakes with icing sugar if desired. This recipe was originally shared with the Cookingnook.com community by Taylor from Canada. She says: I made these in Home Economics in Grade 8. They are so much fun to make and you can make them look like butterflies. To make the cupcakes look like butterflies as Taylor mentions, cut the piece of cupcake that you remove from the cupcake into two pieces and place them back on the cupcake at 45 degree angles to look like wings. I loved these wonderful cupcakes when I was a kid and still do to this day. 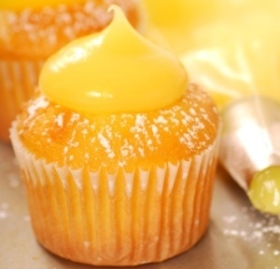 That dollop of lemon pudding in the top of the cupcake is a nice treat. If you love these lemon cupcakes like I do, you may want to browse our entire dessert collection to find more yummy favorites.